The French Bulldog is a small breed, also known as "Frenchies" are on record dating back into the 1800's. The French Bulldog actually originated from England. England wanted a dog to improve the quality of their social and happy lives. Back in the 1800's the woman were often left alone in the home tending to the children and wanted a small loyal, loving, and affeconate companion. Another reason the Frenchie became well known for woman is because the dog were very alert and barked to let the woman know somone was at the door. English breeders started breeding the dwarf version of the English Bulldog puppies in the 1950's crossing it with either a pug or a Terrior. 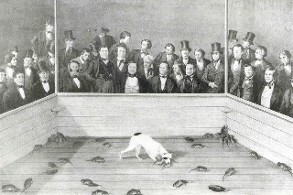 The dogs appeared in conformation shows in the 1960's. These toy Bulldogs weighed 16-25 pounds. At the same time France was changing the industrial revolution. Lace works from Nottingham began to settle in Normandy, France. They brought several dogs including the minature Bulldog. These Toy Bulldogs became popular in France and the trade in importing small Bulldogs from England started. 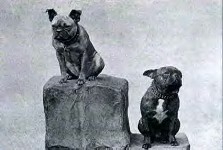 England had the standard for the minature Bulldogs, within their standard they had a fault in the bloodline, ears that popped up was not favorale and the body to be a certain size and weight. When this happened the English exported there unwanted dogs to France. French Breeders gave the dogs name Bouledogue Francais. They started developing the breed cross between minature Bulldog, Pug, and Terrior. The Terrior is what gave the Frenchie's there bat like ears. The ears most likely were pointy and developed the roundness over several generations. A Ratter French Terrior was given the name for baiting Rats. This was a sport in France (picture left below) just like the English had bull baiting. This also became popular for the people to get the rats out of there barns and homes. This sport was also well known in Boston, Massachusttes (picture right below). 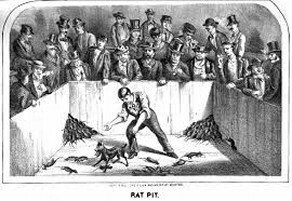 Ratting became popular in the industry because the rats would eat the fabrics to produce clothes, so the ratters was sent to hunt and kill the rats. The Pugs earliest known source is China. They were pets of the Buddhist monasteries in Tibet. The Pug then became known in Japan and continued during the 16th century to be imported with the aid of the East India company. The Pug became the official dog of the house of Orange after saving his masters life. The master was Prince of Orange William the Silent. A ceremony thereafter with orange ribbions was awarded to the pug named Pompey. 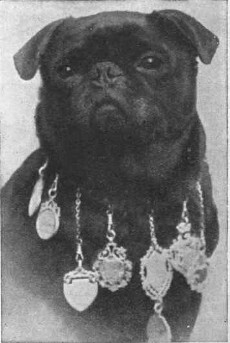 During the British invasion of China in 1860, they brought back the pugs to England found in the Chinese Imperial Palace in 1860. The pugs were made very fashionable by lady Brassey. 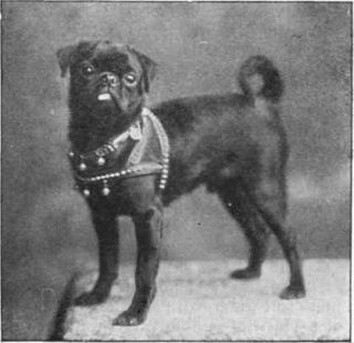 The black pug was not introduced until Lady Brassey exhiited one in 1886. Bringing together these three dogs made the French Bulldog. Different traits and DNA made the tail, ears, head type, color and markings to be one of the most loveable and affectionate dog ever known. 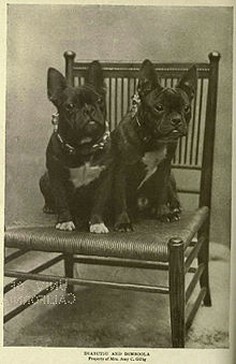 The French Bulldog was officially recognized by the AKC in 1898.